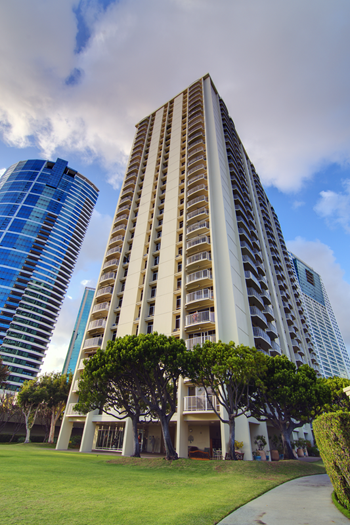 1350 Ala Moana was built in 1968 and was the first residential luxury high-rise in Honolulu. It was designed by Minoru Yamasaki, one of the most prominent architects of the 20th century. His first internationally recognized design, the Pacific Science Center with its iconic arches, was constructed by the City of Seattle for the 1962 World’s Fair. Yamasaki was responsible for the innovative design of the 1,360 foot (415 m) Twin Towers of the World Trade Center in New York City which were tragically destroyed by terrorists on 9/11. Many of his buildings feature details inspired by the pointed arches of Gothic architecture, and make use of narrow vertical windows. Among many other landmark buildings, Yamasaki also designed several sleek international airport buildings, the Federal Reserve Bank Tower in Richmond, Virginia and The Conservatory of Music at Oberlin College.